Commercial decorating has been known to add more business to the Myrtle Beach Area. 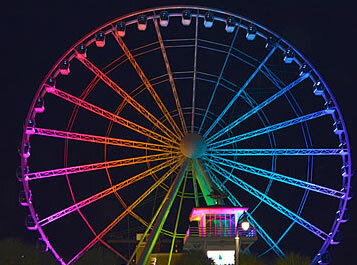 One of the projects that we do in Myrtle Beach is the SkyWheel and it’s complex. We put dedicated power out there so we can run our lights off special plugs. A lot of buildings were not set up or built with Christmas lights in mind. Having specific Christmas lighting power allows a commercial display to run better and more efficiently. On the Sky Wheel project, we outline the ticket building, we add some big 14” garlands, and big 18” bows along the frontage. We also like to do the Palm trees. They usually get wrapped with warm white LED lights and then to add a little South Carolina southern charm we do the treetops in green LED lights. 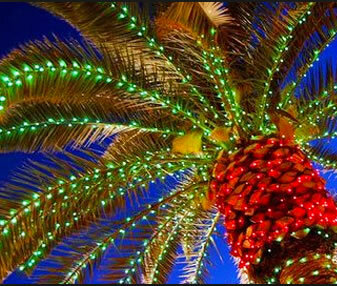 At night, it makes the palm trees brilliant and they really stand out. We have also done the Myrtle Beach Boardwalk which is between 9th and 10th avenue. The Boardwalk area was tied together with the Sky Wheel. We were also hoping we would get one of the Piers to decorate to go along with the rest of the show, but that didn’t quite materialize. Along the Boardwalk area we did our light and music show for residents and tourist to enjoy as they walked by. We broadcast the Christmas songs that went with the animated lights. Since it is broadcast on a local radio station, merchants could tune into the station and play it inside their stores. In addition, we changed around ½ mile of Boardwalk handrails to synchronize with the music. It was quite an amazing show and especially with the fifteen palm trees lit up. We also brought the palm tree decorations around the corner to 9th avenue. It really made the downtown district look put together and really popped up the entire show. The area is much like other commercial or tourist areas where people are out during the holidays and need something to see and do. Going out to look at the Boardwalk Christmas light show becomes a tradition for communities. Any establishment that starts this tradition should know it takes about four or five years to take hold. The first year people go down because they heard about it and are curious what it’s all about. The second year they go back to see if anything has changed. The third year it is starting to become rooted in the community and family holiday tradition. Then by year five the crowds are often huge with limited parking. It really takes dedication and effort making something a tradition. Once the tradition becomes established in the community it will draw the crowds that are needed. We also experimented with the Galaxy laser lighting out in the sand dunes where there wasn’t a lot of light. Some of laser lights were washed out with the ambient light because you really needed it to be dark, but the green poke-o-dots on the seagrass really are a nice touch to the downtown district’s Christmas show. The downtown redevelopment group is pushing to revitalize the area so they play a role as well as the merchants themselves. Some parts of Myrtle Beach will shut down during the cold winter months, but that downtown area is dedicated to pulling in crowds to constitute merchant shops staying open. They also have live music, bands, choirs, Santa Claus showing up, competitive sandbag races, bring your dog day, free food and family events. I believe they are doing a lot of the right things in making the off season become a viable retail season for the community. If you live in an area that needs to “wake up” during the winter months you should consider talking with us at Christmas Décor to see what options might work for you or your community.